There’s an exciting final day in store but there won’t be any Irish players in contention. THE HOME INTEREST in the Irish Open is over as Pádraig Harrington endured a miserable afternoon at Royal County Down to find himself thirteen shots off the lead heading into Sunday’s final round. The three-time Major winner was just one shot adrift of the six man leading pack overnight but carded a seven-over-par round of 78 on Saturday to slide down the leaderboard and leave his hopes of a second Irish Open title in tatters. Seven bogeys and a double did the damage on a day when scoring was not nearly as difficult as what had gone before at the iconic links course. Harrington’s round started with three steady pars but his day went rapidly downhill thereafter on a cold, but dry and bright, afternoon in Newcastle. Bogeys on four and five left the Dubliner with ground to make up and although a birdie two at the seventh saw him remain in contention, a six at the next was a further setback. After the turn, things got worse for Harrington as he dropped another five shots, including three in the final four down the final stretch, to drop 29 places to a tie for 36th. 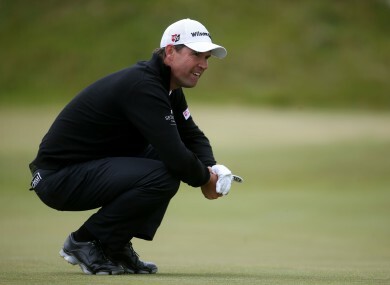 The extent of Harrington’s collapse was heightened by the scoring of those he had been in touch with for the first three rounds of a tournament he won back in 2007. Denmark’s Søren Kjeldsen holds a two shot lead but there are a handful of players in hot pursuit with Maximilian Kieffer shooting a course record 65 on Saturday to catapult himself into contention. The German produced a flawless round despite the strong winds coming off the coast with 15 players recording rounds in the 60s today in comparison to the 14 over the first two days. It looked like Rickie Fowler was priming himself for a final day charge as he eagled the 16th to move within five shots of the leader but back-to-back eights on the final two holes ended his interest. Earlier, Paul McGinley and Shane Lowry both carded 71s to stay three-over and four-over respectively. Graeme McDowell is also three-over while Ryder Cup captain Darren Clarke is three shots worse. Graeme McDowell told us his all-time Manchester United XI: Do you agree? Email “Harrington falls away at the Irish Open after bogey-ridden afternoon ”. Feedback on “Harrington falls away at the Irish Open after bogey-ridden afternoon ”.